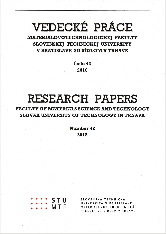 Research Papers Faculty of Materials Science and Technology Slovak University of Technology in Trnava is a scientific journal issued twice a year. The Journal was originally established in 1996. It publishes original and reviewed articles written by experts in the Faculty research fields. Contributions of PhD students and their supervisors involved in the areas related to the Faculty research are also invited. Although a printed version of the Journal is available, all issues are free to download from the Journal web page. Registered with the Slovak Republic Ministry of Culture under EV 3562/09. Volumes each published papers are provided by DOI (Digital Object Identifier). Contributions were edited for linguistic accuracy. All the contributions were double blind reviewed.